The ancient city of Ayodhya, according to the Ramayana, was founded by Manu, the law-giver of the Hindus. For centuries it was the capital of the descendants of the Surya dynasty, of which Lord Rama was the most celebrated king. Ayodhya during ancient times was known as Kosaldesa. The Atharvaveda describes it as ?a city built by gods and being as prosperous as paradise itself?. The illustrious ruling dynasty of this region where the Ikshvakus of the solar clan (Suryavamsha). According to tradition, Ikshvaku was the eldest son of Vaivasvata Manu, who established himself at Ayodhya. The earth is said to have its name ?Prithivi? from Prithu, the 6th king of the line. A few generations later came Mandhatri, in whose line the 31st king was Harischandra, known widely for his love of Truth. Raja Sagar of the same line performed the Asvamedha Yajna and his great grandson Bhagiratha is reputed to have brought Ganga on earth by virtue of his penances. Later in the time this clan came to be called as ?Raghuvamsha?. Bhagirath?s Grandson was Raja Dasaratha, the illustrious father of Lord Rama, with whom the glory of the Kosala dynasty reached its peak. The story of this epic has been immortalized by Valmiki and immensely popularized by the great masses through centuries. Ayodhya: The Ram temple is being assembled in three workshops in Rajasthan and one in UP under the supervision of theVishwa Hindu Parishad(VHP). The plan is to start construction at the actual site in two years whether or not the BJP has a majority at the Centre. (pic: left) . There will be no victors or vanquished after this blast, though. The BJP is worried about the political cost of detonating this bomb, but the Vishwa Hindu Parishad (VHP) is defiant. “We will start construction at the Ram Janmabhoomi site within two years,” said its working president Ashok Singhal. Though one-fourth of the work is over, actual construction at the disputed site can begin only after all the suits relating to it are annulled and land is allotted to the Ram Janmabhoomi Nyas. Asked about the VHP-initiated construction work at Karsevakpuram near Ayodhya, Mahant Nritya Gopal Das, deputy chief of the Nyas, asserted that “the Nyas and the VHP are one” on the question of temple construction. “The sole objective of the Nyas is to build the Ram temple and it is committed to this goal,” he said. The first sandstone blocks arrived in Ayodhya from Bansipahar, near Bharatpur in Rajasthan, in late 1989, soon after the shilanyas, and were stored at a workshop near the Ramghat Chowraha, more than a kilometre from both the Ram Janmabhoomi site and the VHP headquarters at Karsevakpuram. Work on the stones began only in end 1991 with about eight workers who had come from Mirzapur, Agra, Rajasthan, and even Gujarat. Just when the BJP was in sight of victory in the Lok Sabha elections which were a few months away, the VHP purchased a stone-cutting machine for its Ayodhya workshop. Today at Karsevakpuram, 5 km from the disputed site, nearly 150 craftsmen are chiselling sandstone into shape even as two stone cutter machines slice the huge stones; the machines and a generator had been bought from Gujarat for Rs 13 lakh. “The machines have made the work a lot faster,” said Anant Ram, technical supervisor of the Karsevakpuram workshop, which is spread on 2 sq km. So too did Jawanji, owner of the Mahadev Shilp Kala Kendra at Ajari village, and Kastoorlal Padamji of the Bharat Shilp Kala Kendra in Kojra town. None of them had any previous connection with the BJP or VHP. “But as devout Hindus we are keen to see the Ram mandir built,” said Jawanji. The workshops vary considerably in size, from 50-square-foot enclosures to sprawling fields stretching over half an acre. A few are covered with flimsy shamianas, but most have only the sky above. “We expect to complete at least 50 per cent of the pillars in the next two years,” said Rai. So far 32 of the complete pillars have been prepared at Sirohi and 18 at Ayodhya. “I have already sent eight truckloads to Ayodhya,” said Ramesh Sompura. In fact, finding no space left to store the pillars coming from Rajasthan the Ram Janmabhoomi Nyas recently bought three acres land. Rai too took a potshot at the BJP without naming it. “Everyone is in favour of this mission but they don’t have the courage to implement it,” he said. Supporting this sentiment were VHP activists Nagendra Upadhaya and Hariram Gupta who supervise the workshop at Karsevakpuram. Another BJP ally, Mamata Banerjee of the Trinamool Congress, was noncommittal about the Sang Parivar’s ‘hidden’ agenda. “I really don’t know what the VHP is doing, whether it is trying to build any temple at Ayodhya or not,” she said while campaigning for the panchayat elections in West Bengal. His demand that they undertake a “secular jagran” found acceptance with the Samajwadi Party’s Amar Singh, who said that mobilising people was the only way to thwart the “BJP’s nefarious strategy”.Salman Khurshid of the Congress went a step further and accused Home Minister L.K. Advani of “overseeing the entire affair, and he is himself an accused in the demolition case”. The convener of the Babri Masjid Action Committee in Ayodhya, Haji Mahaboob Ahamad, also believes that the temple project has the blessings of Advani and Murli Manohar Joshi. Most of the Muslims of Ayodhya are for a judicial solution of the matter. “We will respect the verdict of the court at all cost,” said M.A. Latif, a former teacher. Muslim politician Syed Shahabuddin has no objection to the pillars being built. “But the suspicion is that they might start building (the temple) upon the concrete platform which was erected during the kar seva in July 1992 defying the Supreme Court orders. Once they start constructing, they will build up public pressure in such a way that it will be impossible to stop them.” He demanded that the government immediately ban transportation of the pillars to Ayodhya from Sirohi. The pillars on which the ‘Ayodhya bomb’ sits have taken shape after the agitation for it began 14 years ago, the same number of years Ram was in exile in the forest. “The temple is inevitable for Ram’s rajyabhishek,” said Nritya Gopal Das. But would He have wanted it on the debris of a mosque? Sompura, 55, is from a family that is a premier exponent of the Nagri style of temple architecture prevalent in the north and the west of the country. The year 1960 was a watershed in his life; the lad of 17 dropped out of college and joined the family profession when his father Balwantrai Sompura drowned in the Ganga while renovating the Badrinath Temple. Grandfather Prabhashanker Sompura, the author of 14 books on temple architecture, came out of retirement to keep the tradition alive. The grandpa became Chandrakant’s guru. Sompura has not looked back since then. His finest achievement is the Swaminarayan temple he built at Neasden in London in a record 28 months. It was VHP chief Ashok Singhal who asked him to design the Ram Janmabhoomi temple and later entrusted him with building it. “About 150 artisans are working at Pindwara near Sirohi in Rajasthan,” said Sompura, though he was mourning his mother who died in May. Sompura said artisans were following computerised directions as in the case of the Swaminarayan temple for which the best Bulgarian limestone from Vrtsa and marble from Sardinia were shipped to Kandla in a container. Before loading, the stones were cut to the required size and every stone was numbered. Over 2,500 artisans from Gujarat and Rajasthan cut, polished and sculpted 26,300 stones, which were then shipped to London and assembled using their code numbers. It was as if the temple were a jigsaw puzzle. Sompura is accustomed to delay. It took him seven years to get the permission of London town planners. “They refused to believe that a structure without reinforced concrete would be durable. The temple was designed to be made of stone to last forever.” Patience had its reward. Sompura won the 1995 Natural Stones special award from the Stone Federation for the best architect designer. Apart from the Ayodhya temple, he is building the Ramnath temple near Gondal in Saurashtra. Going by the family lore, the Sompuras were Brahmin priests who descended from the moon. They had come down to the earth to assist the Moon god perform a yagna to escape a curse and could not return to the moon because they had entered the world of birth and death cycle. Fables are fanciful but there is something that does not die in the Sompura family. It is the living tradition, and it has drawn into its fold Chandrakanta’s sons Nikhil and Aashish, who assist their father in his work on the Ayodhya temple. A visit to the most guarded temple in the country is a daunting experience. Devotees who flock to Ayodhya are greeted by hawk-eyed securitymen, about 4,000 of them, deployed in every nook and corner of the disputed site. The idol of Ram, placed under a soiled canopy, is open to devotees every morning between seven and ten, and between three and six in the afternoon. Visitors have to pass through several security checkpoints before they can have a darshan of Ram lalla. The checks begin nearly half a km from the temple site. After negotiating a steel barricade, visitors are made to walk through a metal detector. The security tightens as they proceed. There are 400 men and 200 women of the CRPF, 2,700 men of the Provincial Armed Constabulary and 200 of the Rapid Action Force keeping vigil for potential troublemakers. A new batch of policemen arrives in Ayodhya every three months: the idea is to prevent the cops from developing a ‘bond’ with the place and its residents. Unknown to most devotees the cops are keeping a watch on them from towers to ensure that no one breaks the security ring. They are assisted by closed-circuit television with cameras installed at vantage points. When the devotees arrive at a second metal detector they are told to deposit all their belongings. Cameras, combs, pens and even matchboxes are a no-no beyond this point: visitors may keep only their wallets. As the visitors near the idol, the automatic gun-toting cops of the Central forces come into view. This is the sensitive zone: police sniffer dogs, in fact, scour the area each morning for explosives. The devotees are frequently told to refrain from standing in front of the canopy for long. A quick darshan, and they are asked to move on, after accepting prasad from a pundit.The government is spending more than Rs 5 crore a month on the security arrangements. Most of the devotees find it stifling, though. “Frequent searches and excessive security rob us of a peaceful darshan,” complained Diwakar Gupta, a businessman from Gorakhpur. Added Nitin Dubey from Sitapur, “The expenditure on the security forces should be diverted for providing clean drinking water, repairing the roads and improving the power supply in Ayodhya.” After the darshan, the devotees take a circuitous route to a heavily-guarded exit, and walk past a fire tender and Home Guard contingents on the ready. For most of them it is an occasion to remember, for many reasons. 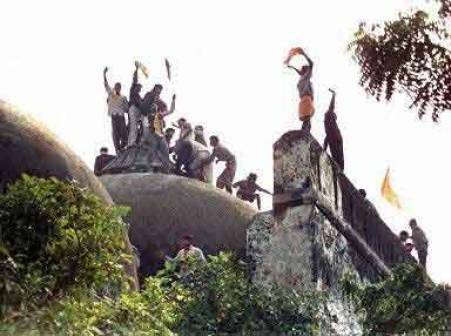 For the last 50 years, and especially from the mid eighties, the Babri Masjid issue has generated a welter of litigation without getting any closer to a solution. Four of the five title suits relating to the disputed spot, all grouped together and being heard by a special Lucknow bench of the Allahabad High Court, still stand. The fifth, filed by Ramchandra Paramhans, a priest, was withdrawn in early 1990. On January 16, 1950, three weeks after the “miraculous appearance” of Ram Lalla within the Babri Masjid, Gopal Singh Visharad filed a suit in the Faizabad civil court for an order against removal of the idols. Simultaneously Paramhans demanded that his right to worship the idols within the Babri Masjid be upheld.Though injunctions were passed upholding these rights, the suits were not disposed of. In 1959 sadhus of the Nirmohi Akhada, which had owned much of the land around the disputed spot, filed a third suit seeking a direction that no one interferes with worship at the Ram temple. Finally in December 1961, the UP Sunni Central Board of Waqfs filed a suit claiming rights to the Babri Masjid and the land around it, which it described as a Sunni graveyard. On July 1, 1989 VHP vice-president Deoki Nandan Agarwal filed a suit on behalf of the deity: it sought a declaration that the area belonged to the deities, and restraint on all those seeking to prevent the construction of a Ram mandir at the site. Unless these suits are resolved, the Ayodhya dispute can never be solved legally. The Centre tried to sidestep them by passing the Ayodhya Acquisition Bill and acquiring the entire area in March 1993. This was, however, challenged in the Supreme Court. The court upheld the acquisition but ruled that the Centre had no right to do with the land whatever it liked; it could only administer the area and hand it over to whoever the High Court rules is the real owner.